Today was a long day. Gardner and I both stumbled in the front door (and were greeted by a lonely puppy) from work at about 8:30pm. We were hungry, tired, and had headaches. Normally when this happens, we look at each other, then at the kitchen, and then agree to go out to a casual dinner. 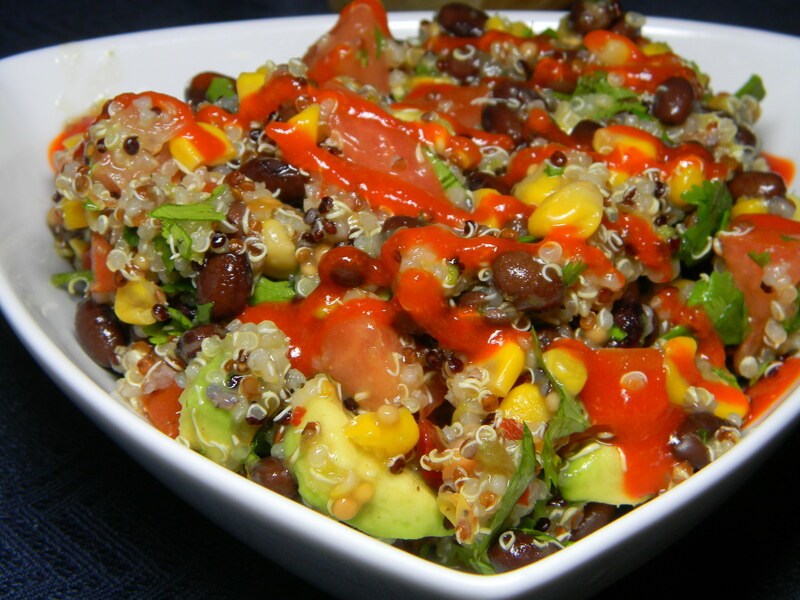 But late last week, while at Trader Joe’s, we tasted a simple, healthy quinoa salad. (I LOVE the tasting table and coffee bar at Trader Joe’s.) We bought the ingredients thinking – this will be quick and easy to throw together for lunches one day this week. Turns out, the recipe was equally easy to throw together for a 9pm dinner, and we couldn’t have been more pleased with the results. It tasted healthy, delicious, and was surprisingly filling, too! We’ve also both commented about how glad we are that we didn’t go out tonight – we don’t feel uncomfortably full, we were able to eat in our sweatpants, and we got to hang out with our puppy and give him some much needed attention. I’d call that a win-win-win.